A tube that transports URINE from the URINARY BLADDER to the outside of the body in both the sexes. 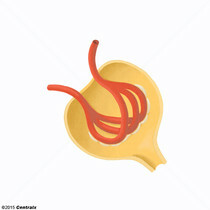 It also has a reproductive function in the male by providing a passage for SPERM. Highly differentiated epithelial cells of the visceral layer of BOWMAN CAPSULE of the KIDNEY. They are composed of a cell body with major CELL SURFACE EXTENSIONS and secondary fingerlike extensions called pedicels. 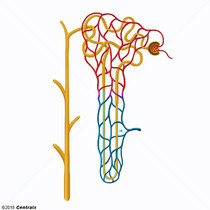 They enwrap the KIDNEY GLOMERULUS capillaries with their cell surface extensions forming a filtration structure. 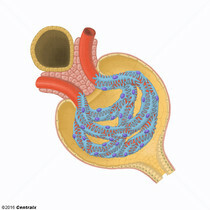 The pedicels of neighboring podocytes interdigitate with each other leaving between them filtration slits that are bridged by an extracellular structure impermeable to large macromolecules called the slit diaphragm, and provide the last barrier to protein loss in the KIDNEY. 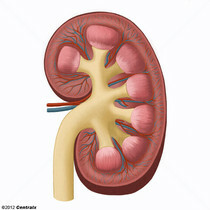 The internal portion of the kidney, consisting of striated conical masses, the renal pyramids, whose bases are adjacent to the cortex and whose apices form prominent papillae projecting into the lumen of the minor calyces. 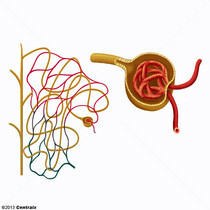 The functional units of the kidney, consisting of the glomerulus and the attached tubule. A double-walled epithelial capsule that is the bulbous closed proximal end of the kidney tubular system. 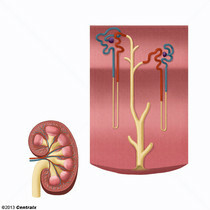 It surrounds the cluster of convoluted capillaries of KIDNEY GLOMERULUS and is continuous with the convoluted PROXIMAL KIDNEY TUBULE. 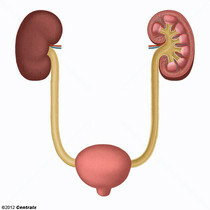 The U-shaped portion of the renal tubule in the KIDNEY MEDULLA, consisting of a descending limb and an ascending limb. 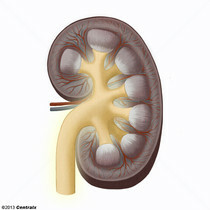 It is situated between the PROXIMAL KIDNEY TUBULE and the DISTAL KIDNEY TUBULE. 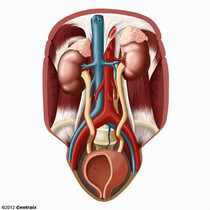 The flattened, funnel-shaped expansion connecting the URETER to the KIDNEY CALICES. 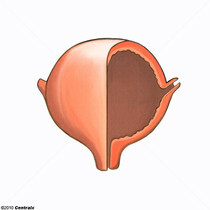 One of a pair of thick-walled tubes that transports urine from the KIDNEY PELVIS to the URINARY BLADDER. 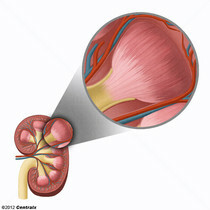 A musculomembranous sac along the URINARY TRACT. 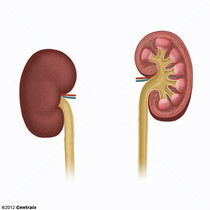 URINE flows from the KIDNEYS into the bladder via the ureters (URETER), and is held there until URINATION.